Southwestern Wire, Inc. galvanized wire has a broad range of uses, both as an end product or an integral part of another finished product. These products can be as simple as electric fence wire or fence post clips to woven game fence or high tensile cable. Material is tracked from rod to wire for specification adherence and quality assurance. By drawing the wire from steel rod we control the gauge to insure the specifications of the customer are met. Once drawn, the wire travels through an acid bath. The acid cleans any impurities from the wire allowing a more secure bond between wire and coating. This provides a longer lasting product that continually resists peeling and corrosion while maintaining a new appearance year after year. 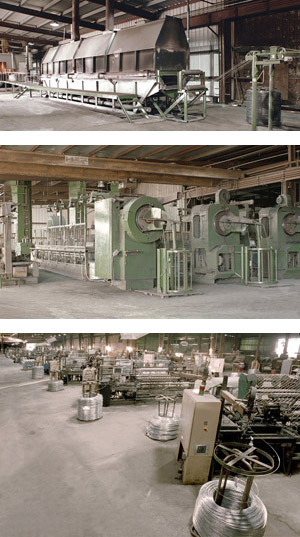 Strand wire galvanizing is a coating process that creates a smooth, uniform epidermis that protects the steel from rust and corrosion. This even layer of zinc provides the necessary defense against the harsh elements of nature over a longer period of time. The method or process of applying the zinc varies by the coating weight needed on the surface of the wire. The process is changed slightly to accommodate the coating weight, the carbon content of the base rod and the tensile needed in the finished wire.